Saint John School has been a blessing for our family. The community is simply amazing. Our youngest daughter was in the hospital for 3 months during Kindergarten. Our school family really stepped in and went above and beyond to help us through this tough time. We felt supported and loved with meals, visits to the hospital, cards from the whole school, prayers, and even a rosary was said for her at school mass. Her teacher and the staff worked with us to keep her on track with her academics. We even had a birthday party with her class in the hospital cafeteria! The whole class came! I am in tears writing this because it means so much to our family. We are so grateful for the academics as well. Our 3 children are all thriving. 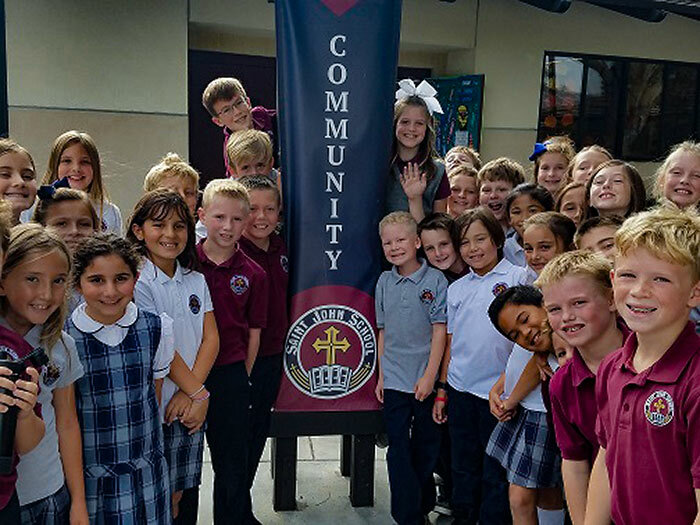 We are comforted in the fact that our children are learning about our faith, putting our faith into action as well being challenged academically. It is bitter sweet that our oldest will graduate this year, but we are confident that she will graduate with a strong foundation in her faith and the tools necessary for great success in high school. Thank you Saint John School!